I am running a summary statistic on a clip to get acre counts by area type. I want to then add a second field that has the acre count from the total area. A third field be added so that it shows as the percentage of each acre type as compared to the whole area. 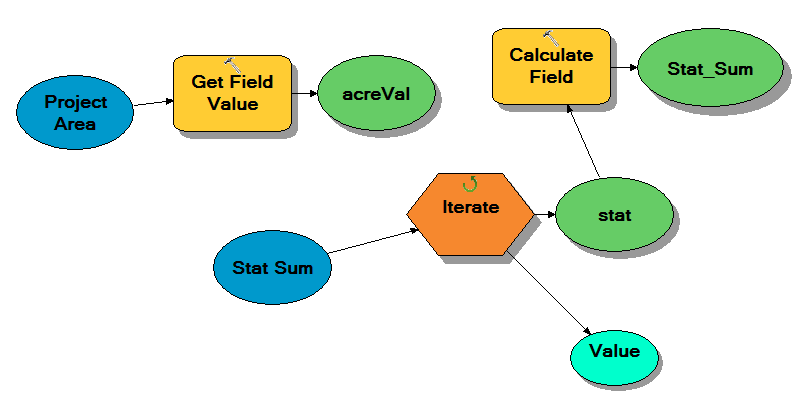 The problem is, I am trying to get the value from the initial project area using the Get Field Value tool. I am able to do this but when using the Calculate Field tool to calculate the third field, I do not know how to get this option. Can I set the value from the Get Field Value to a variable then in the Field Calculator use Python to call the variable? Will it recognize the variable? You can do this in ModelBuilder using Get Field Value on your project layer (against pre-calculated area or acre field), and using in-line variable substitution within a Row Selection iterator, and calculating using field calculation on the sum stat table. Not the answer you're looking for? Browse other questions tagged arcgis-desktop arcgis-10.2 modelbuilder field-calculator arctoolbox or ask your own question. 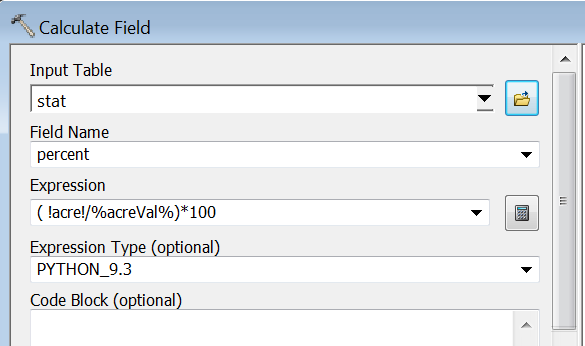 Sum field and use that sum to populate existing field in same table using ArcGIS ModelBuilder? Calculating percentages in ArcGIS field calculator gives TypeError: 'float' object is not iterable? Calculating frequency and area percentage of certain type of landcover in raster data using ArcGIS for Desktop? Preventing Calculate Field tool slowing when iterating in ModelBuilder?